Day four of the TCM Film Festival was bittersweet. Sweet because there were some great movies on the schedule and bitter because I knew the festival was soon coming to an end. As usual, several movies were running on or around the same time, so tough decisions had to be made. Once again I tried to see movies I hadn’t seen before or in a long time. I pretty much fulfilled that goal. My first movie was screening at 10 a.m. so I got to take my time, enjoy my breakfast, and leisurely make my way to the Chinese Multiplex. The first movie I saw turned out to be my most enjoyable experience of the festival. 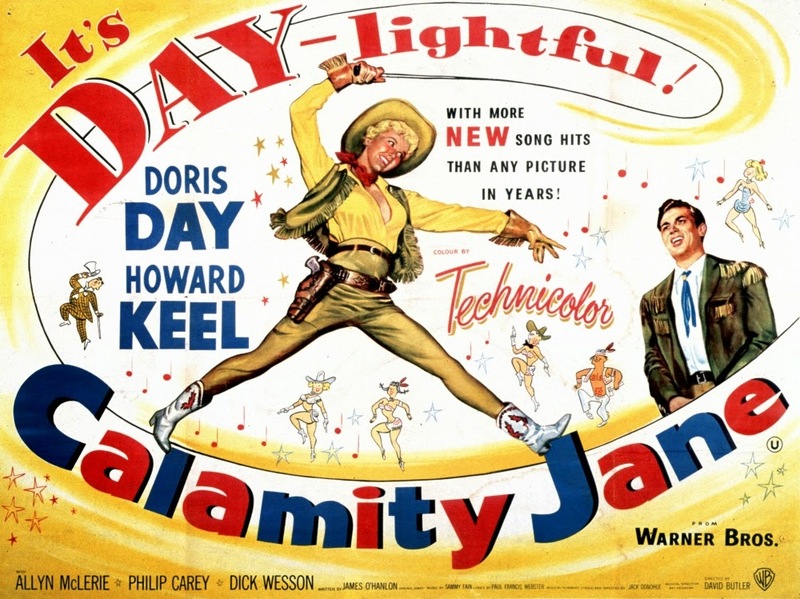 Calamity Jane (1953) was a movie I saw once on my Kindle Fire over a year ago. Seeing it on the big screen with an enthusiastic audience was a treat I hadn’t expected. Cari Beauchamp, the award-winning writer and documentary filmmaker, introduced the film. Of course the history is all wrong; there isn’t that much we know for certain about Calamity Jane (Doris Day) and her relationship with Wild Bill Hickok (Howard Keel). We’re not even sure if they knew each other at all, but so what; it’s a movie. Beauchamp encouraged those in the audience to go to the Academy Award Web site and petition for a special Oscar for Day. She certainly deserves it, as the morning crowd at the Chinese Multi-Plex would attest. The fun started as soon as the credits began to roll. When Day’s name came on the screen, the audience broke out in applause. Keel’s name was also welcomed with a good round of clapping as was the rest of the cast and director David Butler. Each musical number was a joy to watch, with each followed by more clapping and hooting. The world premiere restoration was beautiful. The film was an amazing showcase for Day’s singing (what a voice! ), dancing, and comedic acting and timing. The songs by Sammy Fain and Paul Francis Webster were catchy and the Oscar-winning “Secret Love” became one of Day’s signature tunes. After the movie concluded, I was humming the “Deadwood Stage” for the next two days all the way back to Chi-caw-gee! 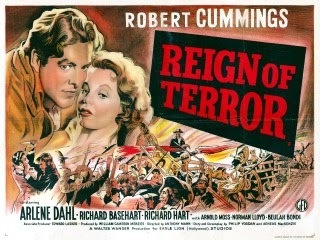 After Calamity Jane, it was on line for Reign of Terror (1949), a movie I don’t think I ever heard of before. It was an unusual combination of historical drama with a film noir feel. The movie was introduced by Eddie Muller, founder and president of the Film Noir Foundation. Reign of Terror is an interesting tale set during the political struggle after the French Revolution. The machinations of Maximilien Robespierre (Richard Basehart) and his attempt to recover his “black book,” an enemies list that is the “McGuffin” and sets this film in motion. Charles D’Aubigny (Robert Cummings) who is impersonating Duval, a man he killed, who Robespierre and his right-hand man Fouche have never met before, has stolen the black book. Along the way, D’Aubigny meets Madelon (a ravishing Arlene Dahl) a friend of the Revolution who assists D’Aubigny expose Robespierre for the scoundrel he truly is. The low-budget production looks first-class thanks to the talent involved, including director Anthony Mann, writers Aeneas MacKenzie and Philip Yordan, and producer William Cameron Menzies. Others in the cast include the great Norman Lloyd, Richard Hart and Beulah Bondi. I found the film to be fast-paced and exciting. It was almost like an expanded version of the M-G-M serial series, The Passing Parade. And that’s a compliment! Next on the agenda was The Philadelphia Story (1940). While not a big fan of this classic (blasphemy, I know), seeing it on the big screen at the Chinese Theater (my first time in that movie palace) was a treat. Ileana Douglas and Madeline Stowe introduced the film. Stowe a big fan of classic romantic comedies, rattled off a string of favorites, including George Stevens’s The More The Merrier, and I thought, this woman has great taste (who knew?). Cary Grant (Dexter), Katherine Hepburn (Tracy), and James Stewart (Macauly “Mike”) all looked great on the big screen. It was also nice to see Ruth Hussey in her Academy Award-nominated performance as Elizabeth Imbrie, Mike’s coworker and sometime girlfriend. The plot is well known so I won’t go into that. The production was wonderful, even though not a single frame was shot anywhere near Philadelphia. Virginia Wiedler as Hepburn’s younger sister Dinah practically steals the movie; she’s even better than I remembered (it must be that big screen). During the end of the film, Kristina had to leave to catch her flight back to Canada. On the way out she ran into Ben Mankiewicz and actually talked with him for a few minutes. A nice consolation and a great memory for my friend. 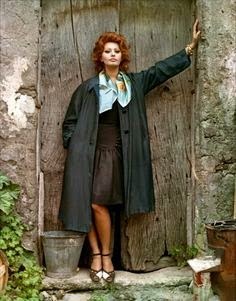 Next I was back on line at the Chinese Theater to see Sophia Loren in Marriage Italian Style (1964). I had never seen this film before, but the real attraction for me was to see Loren in the flesh. She was interviewed about the film by Ben Mankiewicz before the screening. She looked amazing (she’s 80!?) and seemed very happy to be at the festival and was very appreciative of the audience. She talked about making the movie with frequent costar Marcello Mastroianni and director Vittorio De Sica. For me the movie was somewhat anticlimactic. There were parts that were enjoyable and Loren and Mastroianni were wonderful, but overall it’s not a film I need to see again. It was enough to see Loren in person, a once-in-a-lifetime opportunity. to everyone. What a great thing it was to meet all the TCMParty folk: Joel, Laura, Kristina, Pam, Kellee, Aurora, Karen, Will, Annmarie and so many others. Well it was time for bed and getting up early for the flight back to Chicago or is that Chi-caw-gee! This was my first time at the TCM film festival. I had never been to a film festival before so the experience was completely new to me. It was both exciting and overwhelming, but great fun. If I have the good fortune to attend again next year, I’ll be better prepared. Look for my next blog post: Tips for First-Timers coming soon.